I Am a Mommy: CaShawn Thompson on Mothering as Divine Responsibility. 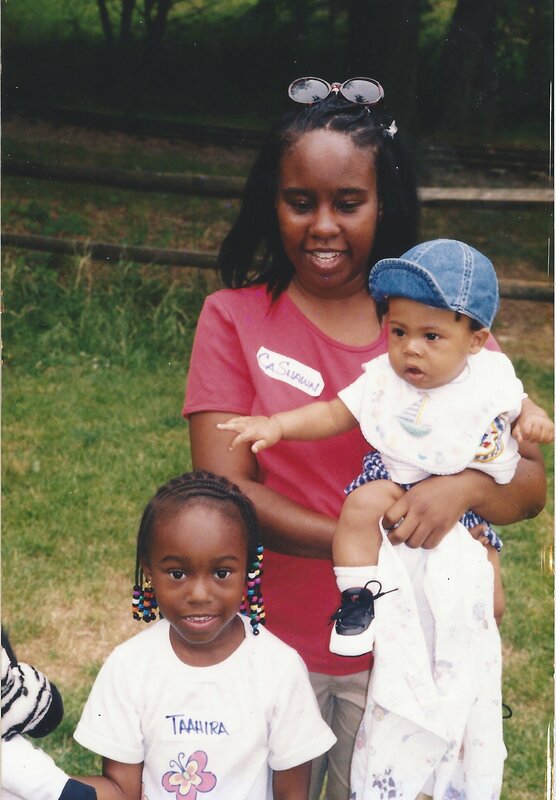 The author, in 1999, with her 5-year-old daughter, Tee, and 6-month-old son, Ikey. I had this whole essay about my journey as a Black, unmarried mother, who is now parenting older children written out and just like that, it needed to be re-written. I have to change what I thought was happening all up n’ through this little soliloquy of mine because of a conversation I just had with my 19-year-old daughter. That is what your children do from day one: they re-write your story just by showing up. My daughter, Taahira and her 15 year-old brother, Isaiah, have been the center of my world and the Light in my darkness for the past twenty years. I have been their mother for half of my time here on earth. I don’t even remember much of my life before them. I went straight from being my parent’s child to being Tee & Ikey’s Mommy. I have no idea who I would have been without them, nor do I care to imagine. I don’t think anything would have been better than this. Motherhood has been the single most gratifying and challenging undertaking I’ve ever managed not to mess up. Parenting my children has grown me in ways that I couldn’t otherwise fathom. I am truly grateful for the blessing.